Harry finds his child and Fiona; the Pithos is as close and as far as it has ever been. Harry Strange episode 315: What Lovecraft Said Part 2 was written by Tony Sarrecchia and directed by Jason Tyler. Sound Design by Molly Silverman and Tony Sarrecchia. All material is copyright (c) 2018 by Tony Sarrecchia and used with his permission. 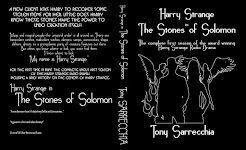 Be sure to join us next time for the finale of the Harry Strange Radio Drama. I am JoAnn Pruden. Goodnight! We Are Back on iTunes! Harry Strange radio drama is now available on iTunes! Please follow this link Harry Strange TOS on iTunes to subscribe. When iTunes relisted us, they lost all our ratings and reviews. If you could show us a little love there it would help get regain the ground we've lost over the past year. Thanks! From the iTunes menu bar: select File/Subscribe to Podcast and paste this address in the field that opens http://harrystrangeradiodrama.libsyn.com/rss Click on FEED and you'll have access to the entire Harry Strange Radio Drama catalog. We hope iTunes gets this resolved soon. Thanks for your patience.